Most of the time, when we as workers fail to meet the requirements that we were supposed to get, all we get is a loss of our yearly bonus. That is, assuming that your career option is relatively secure – in this day and age, it is more likely some of us may lose our jobs in the company’s attempt to cut losses. Either way, it is not a fun experience for everyone involved. 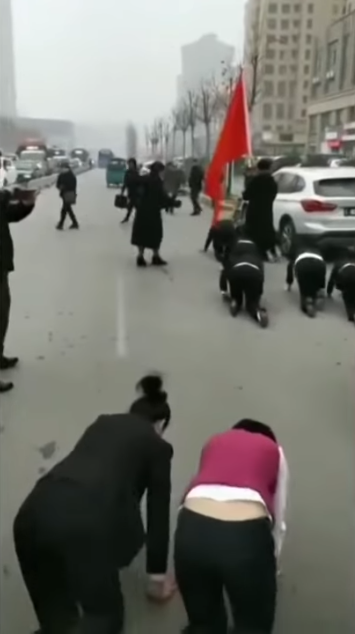 This unnamed company based in the city of Zaozhuang, China’s Shandong Province has a decidedly different approach to failure, however – one that might leave you wanting to be fired instead. After reviewing the year-end targets set by the company for its employees, the company decided to punish these folks in what is likely the most humiliating way possible. On the 14th of January, residents who were heading about with their lives on a busy street in the city witnessed an incredibly bizarre sight. 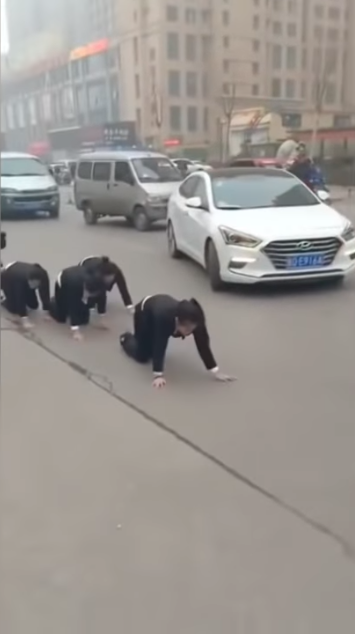 An entire row of people dressed smartly in uniform and suits crawling along the pavement on their hands and knees. 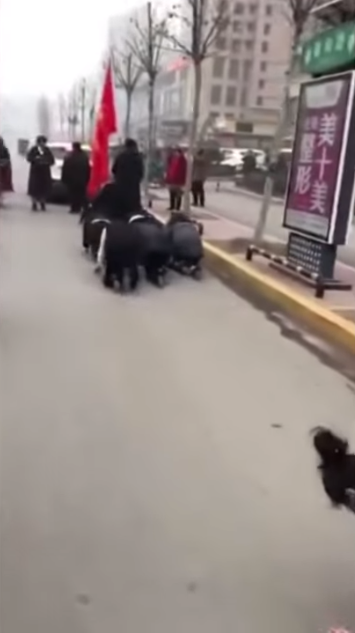 Onlookers were incredibly confused and curious at the sight, but were quick enough to pull out their phones and snap photos or take videos of this strange behavior. This is certainly something worth documenting, considering you don’t see such behavior every day. Judging from the intention behind this incident, it is likely all that attention was intended as part of the punishment. Information later revealed that this was a punishment enacted by a company on its employees for not meeting their targets for the year. 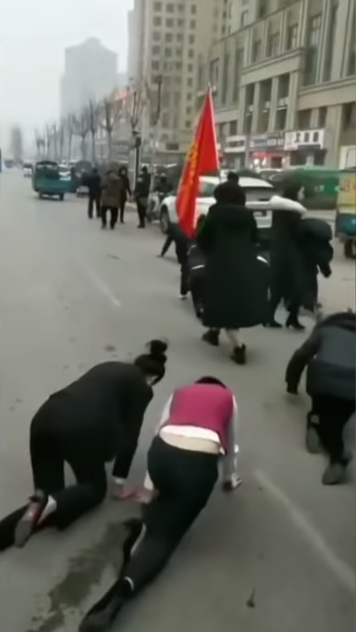 Videos of the incident quickly went viral, showcasing these full-grown adults – who all appear to be women and reportedly are employees tasked with selling beauty products – crawling on the rough road on their hands and knees. There is no telling just how long they have been doing this for, and how exhausted and injured they must be. Just try walking barefoot on the road on a hot day for comparison. Leading the procession is a man who is holding a flag and walking at a very slow pace. Even with the pace he has set, however, the employees are visibly struggling to keep up. He’s presumably marking the start of the line and drawing further attention to these employees. As if they hadn’t been embarrassed enough as it is! Shortly afterwards, the police took note of the situation and decided to intervene to stop this horrible treatment. They got the organisers to call off the event, and later had the company temporarily shut down for further investigation. If the company’s productivity was already bad before, it’s now come to a screeching halt – a small justice for the inhumane treatment these poor employees were forced to undergo. In the meantime, Chinese netizens across the country are sharing their shocked and horrified reactions across cyberspace. There is no telling whether there will be further justice for these employees, but is horrible to think that in this day and age companies still think they can get away with this.